And so my Skyforger journey is complete. In a way I am glad that I took a roundabout, not chronological, itinerary. Kauja Pie Saules (The Battle of Saule) drew me in, showing glimpses of a band both passionate about its Latvian roots and proud of its black metal origins. Semigalls’ Warchant demo reissue further reinforced the notion of how far Skyforger have come without completely forgetting where they began. Not counting the acoustic folk song collection of Zobena Dziesma (Swordsong), Perkonkalve (Thunderforge) is the latest full length by the band. Not only it bridges over the entire Skyforger career, to these ears it sounds the most organic and complete, where folk elements of Skyforger music finally blend seamlessly with their brand of progressive extreme metal. Not to be overly analytical about it, there are three types of songs on Perkonkalve. Some, like Kad Usins Jaj (When Usins Rides), Gada Isaka Nakts (The Shortest Night of the Year) and the title track are propelled forth by almost heroic epic metal riffing, yet they very naturally feature kokle (Latvian acoustic string instrument similar to Russian gusli), flute, bagpipes and Latvian folk inspired melodies. Quite heavy, these songs help me to imagine Skyforger as war hardened minstrels, clad in traditional clothing, completely immersed in the atmosphere they just helped create. One more time I am drawing comparisons to early In Extremo, with a much localized origin. At times, the minstrels grow restless, they need to release the aggression building up inside of them, so blasty Nakts Debesu Karakungs (Warlord of the Night Sky) comes out with its cutting fuzzy guitars. Similarly extreme, but quite progressive with its divergent atonal guitar soloing, Cusku Sieviete (The Woman of Serpents), almost spans the whole entire Enslaved career, from the raw origins to the synth moments a la Below the Lights. Finally, we have the wonderful metal adaptation of folk songs, as in the instrumental Garais Dancis (Long Dance) with its bagpipes and rattles, and wonderful a capello singing awesomely transitioning into a heavy arrangement on Migla, Migla, Rasa, Rasa (Oh Fog, Oh Dew). Nothing on that song is out of place, neither the female backing voice nor mouth-harp repeating the guitar riff – that song, perhaps, is the album’s crowning achievement. Mournful, epic doom, My Dying Bride riff, what folk history is without heartbreak, on Caur Aizsaules Vartiem (Through the Gates of the World Beyond) completes the picture. The sound captured on the album is fantastic. Neither completely clean, but definitely not blurry raw black metal, I can only characterize it as rustic. Something else that was the subject of criticism, and even ridicule, before were Peter’s vocals. Just like the album’s sound, they also made to fit the story Skyforger is trying to convey on Perkonkalve. Partially clean (where Peter shows how well he can really sing), they are more of the Entombed-like barks, manly, with little hoarseness, but very legible. I could definitely make out the lyrics, if I could understand Latvian. Speaking of the lyrics, while not a concept album, Perkonkalve touches on many aspects of Latvian mythology. If you read the booklet attentively, you would be able to understand why some songs are sunlit and heroic, while others are much darker and quite extreme. The forces of day and night, the gods of Sun and Moon are represented well by Skyforger, their spirit captured fittingly, with little man-made folk fragments interspersed in between. 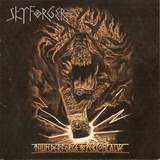 To finish up my review trilogy, it is a fact that in Skyforger we are dealing with an authentic, very original band, playing the style of metal like no other, since there aren’t many pagan Latvian metal bands. Go for their older material, if your heart is closer to Nordic black metal, or pick up Perkonkalve if less extreme, but nevertheless epic, music is to your liking. It is interesting how history changes, when in late 80s hard rock Latvian band Perkons was banned by Soviet censure, and now we have Skyforger serving as Latvian messenger at the Heathen Crusade Festival in Minnesota in 2007.